But first there is an exciting event coming up! Tomorrow is World Card Making Day! And on top of this amazing fun, a group of talented blog friends and I are beginning our 7 Days of Halloween Inspiration hop on SUNDAY! We are all eager to share some fun spooky cards and projects. We'll be going all week long, so be sure to stop back tomorrow for WCMD and Sunday for the hop! 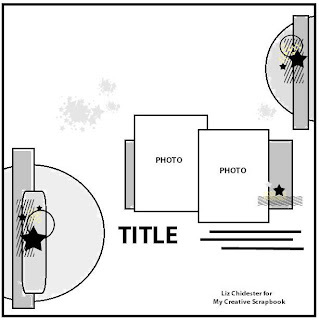 There is a new layout sketch and card challenge over at the DCWV blog! Play along using any of your DCWV stacks for a chance to win some fantastic pretty papers :). Today I'm using the Vintage Collector stack. All of the little elements are also available in the Vintage Collector stack. I just added a bit of India Ink (black), washi tape, and a journaling card. I created one more coordinating page with a photo from my birthday dinner. This picture of Matt will likely be my favorite photo of the year (he has given me permission to post it!). This layout will also be entered in the Moxie Fab "Ready Made Embellishment" challenge because it uses all these great elements and journal cards from the Vintage Collector stack. Have you had enough photos yet? No? Perfect. 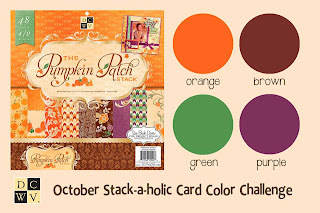 Because now I have a quick card to share with the DCWV color combo for October. This is also my Unity Stamp Friends with Flair project. This card uses papers from the DCWV Pumpkin Patch stack and stamps from Unity (many are random grab bag stamps). Great layouts! I really need to get back into scrapbooking and your card is beautiful - I love all the combined elements along with the white space. Fun projects, Rachel. Lovely flowers... Happy Belated Birthday! Yeah, birthdays! Great layouts to keep the celebration going! And Unity...wow...I love those grab bags!!!! Oh what a story you have told! Thanks for sharing a slice of your life! Love the beautiful flower LO, laughed at the spicy LO, and loved your FWF card. Delightful! That's a gorgeous layout and card!! Fun colors ! Aren't the grab bag stamps the best? I love getting busy with them! These are so great. The layouts are great (I really like the colours you used) and the card is just beautiful! Happy Bday. And great projects. Tks for sharing. Lovely card. I like the color scheme and colorful, fall leaves. Thank you for sharing. Gosh, you rock the layouts and card!! This is tremendous! Love this post, Rachel!